"It was a wonderful trip. 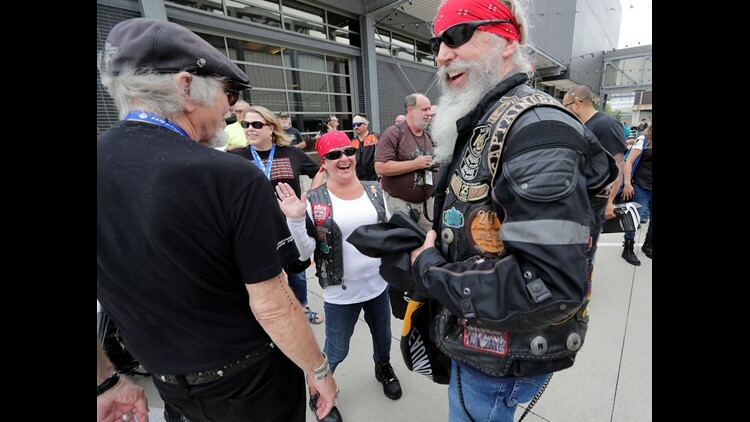 You gotta keep that throttle twisted to get over here," said Curtis May (right) of Beaumont, Texas, who greets Willie G. Davidson Tuesday at the Harley-Davidson Museum after riding from Texas to San Diego and then Milwaukee for the Harley-Davidson 115th anniversary celebration. Harley-Davidson says it has signed an agreement to sell clothing and accessories on Amazon’s website, a step that could reach millions of customers. Starting Monday, certain items are available for purchase in the U.S., with two-day shipping for Amazon Prime members, Harley-Davidson said. “We live in an on-demand, anywhere, anytime business environment where success depends on the ability to meet consumers on their turf and on their terms,” Heather Malenshek, Harley’s senior vice president of marketing and brand, said in a news release. For decades, Harley has aggressively pursued the “motor clothes” market with jackets and other apparel that are fashionable and functional. Zippers on jacket sleeves, for example, keep the wind out when riding in the cold and serve as vents when opened on a hot day. Clothing sales are a big part of Harley-Davidson’s business, and for years the company’s dealerships have sold items online. But dealerships have been limited to selling non-current or obsolete items on Amazon. That won’t change, Harley says. But now the company has its own Amazon storefront selling current-year merchandise directly to consumers. The idea behind the Amazon connection is to reach customers who normally wouldn’t go to a motorcycle dealership but are attracted to the clothing and the iconic brand. Increasingly, U.S. consumers shop both online and in brick-and-mortar stores. “We live in this environment where success depends upon the ability to go where customers are, rather than expect that they are going to come to us,” said Harley spokeswoman Patricia Sweeney. Harley says it held a webinar with its dealerships telling them about the Amazon partnership. The company says prices will be the same as in dealerships, and it will also collect sales tax. Harley says it’s pursuing agreements with international online retailers as well as Amazon. The steps are part of the company’s broader plan, called More Roads to Harley-Davidson, aimed at attracting new customers.